Political terrorism and insurgency have become the primary means of global war among states. Lacking comparable military and political means to compete directly with Western civilization, many failed states and tribes have honed the art of asymmetric warfare. But traditional models of organizations do not work under normal or these extreme circumstances, precluding realistic models of terrorism and a fruitful search among alternatives for potential solutions. In contrast to traditional models, we have made substantial progress with a quantum model of organizations, which we further develop in this study with the introduction of a case study of a normal organization in the process of being restructured. We apply preliminary results from our model to terrorist organizations and counter terrorism. W. F. Lawless is a Professor of Mathematics and Psychology at Paine College in Augusta, GA. He completed his PhD in experimental psychology with a focus in social psychology and groups atVirginia Tech in 1992. His research interest is in organizational theory. He has an MS in Mechanical Engineering from Louisiana State University and was a Professional Engineer with the Department of Energy at its Savannah River Site; in 1983, he blew the whistle on DOE for mismanaging its nuclear wastes at SRS. In 1994 at the request of DOE, he joined its SRS Citizens Advisory Board to provide advice on the cleanup of SRS. Margo Bergman received a B.A. in Economics from the University of Texas and a PhD in Economics from the University of Houston. Her scholarly interests include computational economics, experimental economics and industrial organization. She is author and co-author of several professional papers and has presented her work at national and international conferences. She is a member of the Society for Computational Economics, American Economics Association, and International Society of Dynamic Games. Jorge Louçã is a Professor of Programming Languages, web application models and computational simulations with multi-agent systems at the Instituto Superior de Ciências do Trabalho e da Empresa (ISCTE) in Lisbon, Portugal. He earned his PhD in informatics from both the Universite Paris IX Dauphine, Paris, France and Faculdade de Ciências da Universidade de Lisboa (FCUL). He is Vice-President of the Departmento de Ciências e Tecnolgias de Informação and the Scientific Coodinator of the Master Course in Complexity Sciences in collaboration with ISCTE and FCUL. Nicole Kriegel received her BA degree in psychology and sociology from William Penn University in Oskaloosa, Iowa. She is pursuing an MS degree in experimental psychology at Augusta State University, Augusta, GA, and plans to pursue a PhD in social psychology with an emphasis in psychology and law after completing her MS. Her research interests include jealousy, celebrityworship, positive psychology, compulsive and impulsive buying, job preferences and gender, and decision making. Nick Feltovich is currently an associate professor of economics at the University of Houston, having earned his Ph.D. in economics at the University of Pittsburgh. 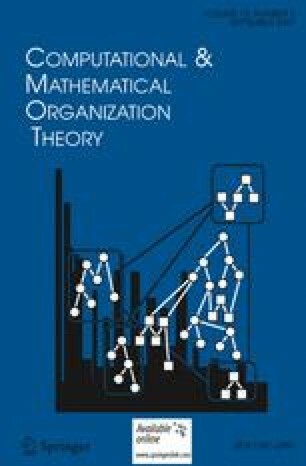 His fields of study include game theory, computational economics, experimental economics, industrial organization, and behavioral economics.